The Steel Horse Rally Inc. is a non-profit 501(c)3 established in 2015 to benefit local charities. Don't forget that every purchase is a tax deductible donation that helps the Steel Horse Rally Inc. and its charities. 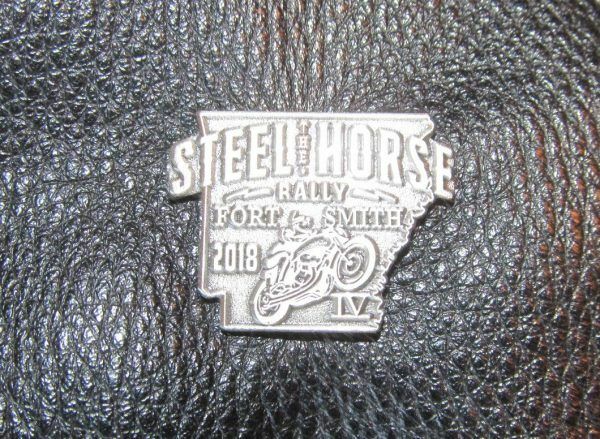 The official Steel Horse Rally pin for 2018 commemorates not only the 4th Annual Steel Horse Rally but the Inaugural Steel Horse Rally Shootout featuring motorcycle racing for the first time as part of the rally. The pin is in brushed antique metal. All proceeds go to the Steel Horse Rally Inc. charity. ($6 price includes shipping to anywhere in the USA. ).